Have you ever visited a cat cafe? If you’re a cat lover, the answer may very well be yes. But have you ever visited a mobile cat cafe? 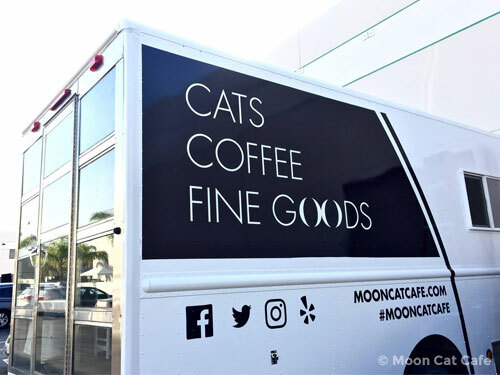 I’d like to introduce you to Moon Cat Cafe, the first ever mobile cat cafe! Food trucks have grown in popularity during the past decade. They are no longer only seen at construction sites during lunch time. You can spot gourmet food trucks at special events, on college campuses and even lining the streets of popular dining destinations. So, why not take that concept of mobility and expand it to a cat cafe? That’s exactly what founder and owner Janet Pao did with Moon Cat Cafe. 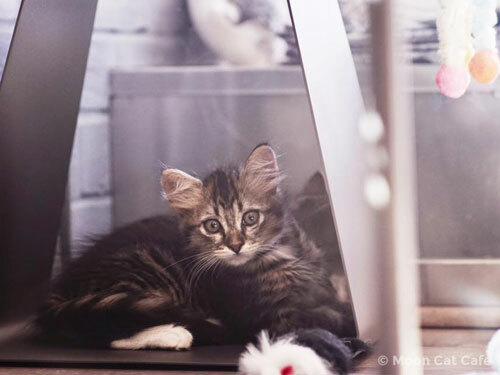 You can find Moon Cat Cafe at special events throughout Los Angeles and Orange County in Southern California, promoting cat rescue and adoption. And that’s actually how I learned about the cafe. A while back, I was browsing theaters that were showing the (pawesome) cat movie Kedi, and I saw that Moon Cat Cafe had teamed up with a local art-house theater and cat rescue group to celebrate the movie. While I was too late to attend that event, I was eager to learn more about the cafe. When did you start Moon Cat Cafe? 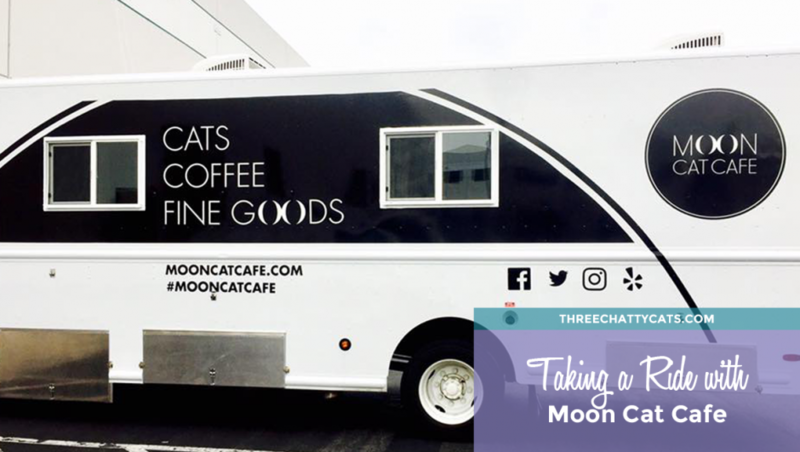 The idea of Moon Cat Cafe started in January 2016, and I officially opened for business in December 2016. How has the response been to the cafe? The response has been incredible – I’m very grateful for and enjoy meeting every single visitor. When I first started Moon Cat Cafe, I honestly had no idea what people would think. 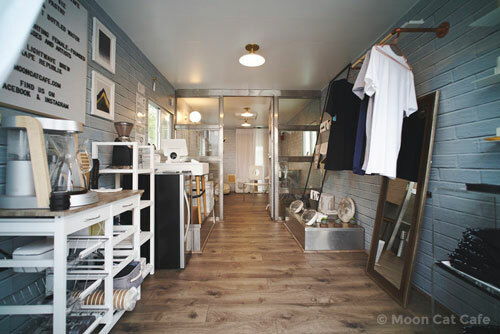 The cat cafe industry itself is still fairly new here in the US, so trying to create a brand-new segment within that industry with the mobile cat cafe concept is a pretty big risk. But I knew that if I wanted to differentiate myself from not just every other cat cafe in California, but every other cat cafe period, I had to try to innovate a whole new category. There’s no market research or industry data on cat cafes at all, so my expectations are constantly evolving as new opportunities come up. 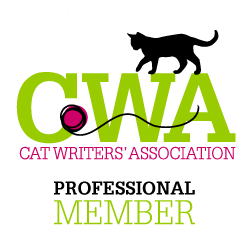 It’s more of a grassroots approach, working with a network of small local cat rescues, sourcing from fellow independent small businesses, and relying on social media and word-of-mouth. It’s definitely not as conspicuous as partnering with a huge rescue organization and getting tons of media coverage, but I like it. I think it fits my small, cozy, rogue cat cafe on wheels. 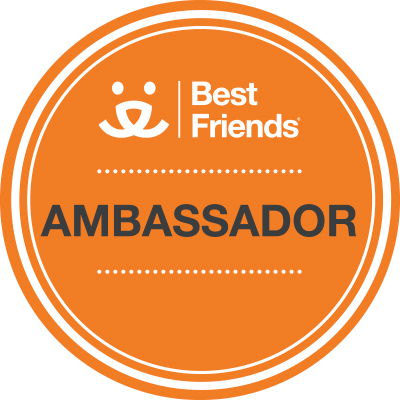 And I believe that building trust and good relationships with as many communities as I can will lead to good things. Do you have any cats yourself? Yes, I do! 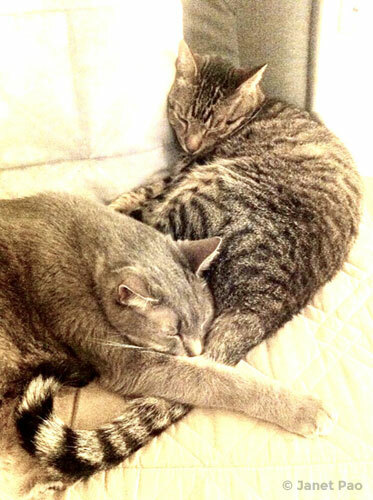 I have two seniors cats, Sigfrey (17) and Sampson (8). They’re both adorable, lovable old dudes. I adopted them from a former colleague whose husband developed such a bad allergy that his doctor said they had to give up the cats. That was five years ago, and one of the best decisions I’ve ever made. I have yet to visit Moon Cat Cafe myself, but I find it to be an interesting concept. 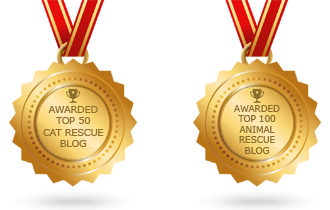 And anything that raises awareness for cat rescue and adoption is a good thing in my book. 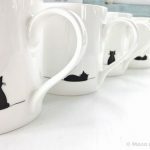 Mugs at Moon Cat Cafe. 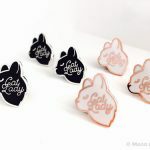 Pins for sale at Moon Cat Cafe. You can find Moon Cat Cafe on Facebook and Instagram. What do you think about this concept of a mobile cat cafe? 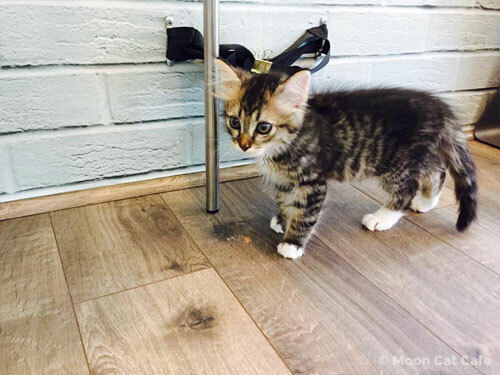 ***All photos used with permission from Moon Cat Cafe. 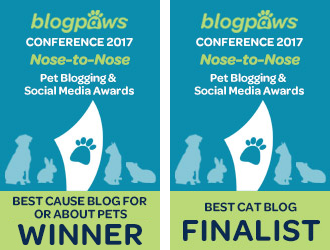 Previous Cat Pawsitive 2017 – That’s a Wrap! what a cool idea….and the thought of being mobile means she can be where the people are at….love it! What a great concept! 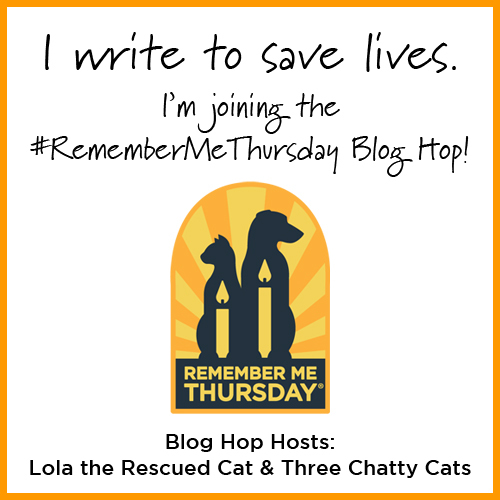 I am all about anything that exposes more cats to the chance to be adopted! Love the idea! 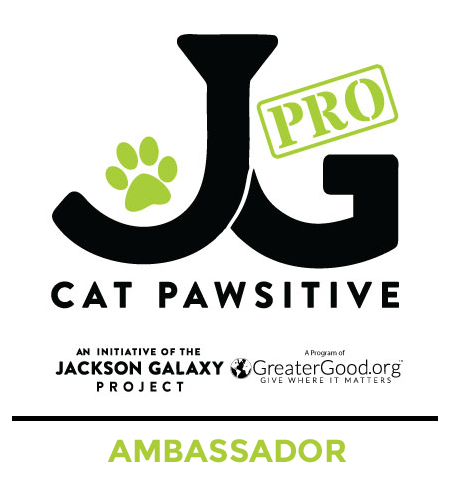 We wish her success in her journey to create a unique and differentiated cat cafe experience! This is a wonderful idea and we wish there were more of them around the country. Many, many more! Think of all the awareness and adoptions there could be! Great interview! Awesome photos! Now THIS is cool! I imagine there are people who’d think, “Huh. Cat cafe? Whatever,” about a single location … but those same people might decide to try something new if it’s right in front of them. BRILLIANT! The people who already share their lives with cats know how wonderful they are … it’s the “undiscovered” cat people who will make the most difference. That Whisker Mobile really is super cool indeed! That is a super idea! Humans are starting to get it more & more that the world is a much better place when there is a cat wherever you go! How many kitties travel in the mobile cafe at a time? 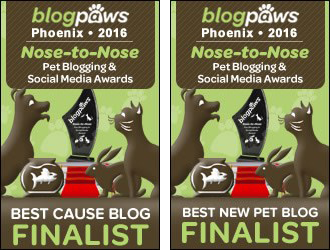 Thanks Chatty Cats fur sharing & spreading the news! 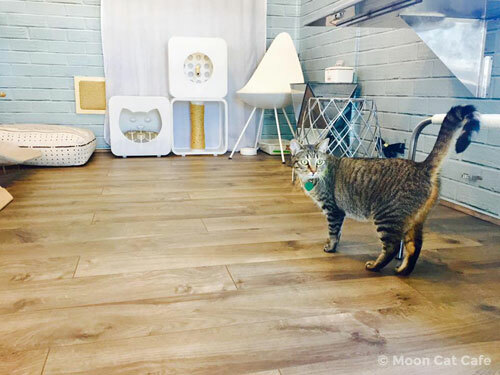 Kitty kudos to Moon Cat Cafe fur thinking outside the box! Thanks for stopping by, Valentine! From what I can tell, the two “regulars” are Sigfrey and Sampson. But at adoption and special events, the cafe will host adoptable cats from a rescue and Sigfrey and Sampson take a break. Such a great idea! I hope to see more of these. i wish they would come to canada! Great idea! NYC has so many food trucks for the past 30 years, they had to declare areas where the trucks couldn’t be. You can vote for your favorite ones, etc. I’d vote for a mobile cat cafe! Canada needs a mobile cat café….c’mon let’s see some action up here. What a great idea! We need a mobile cat cafe here. Dat’s pawsum. And what adorable kitties. big hugs and Happy Mother’s day awnty Rachel. Now that is innovative. Hope it is successful. Wishing Janet Pao all the success with this in the world! Great concept! This concept is such a great idea! Unfortunately I haven’t had the opportunity to visit a cat cafe yet since there are no cat cafes in my country.